Deaf on TV, theatre or film has never translated well for me. Usually it is some rubbish romance story about deaf meets hearing and love conquers all like Children of a Lesser God. I hated this movie and made myself unpopular by insisting that Marlee Matlin was irritating and overacts. 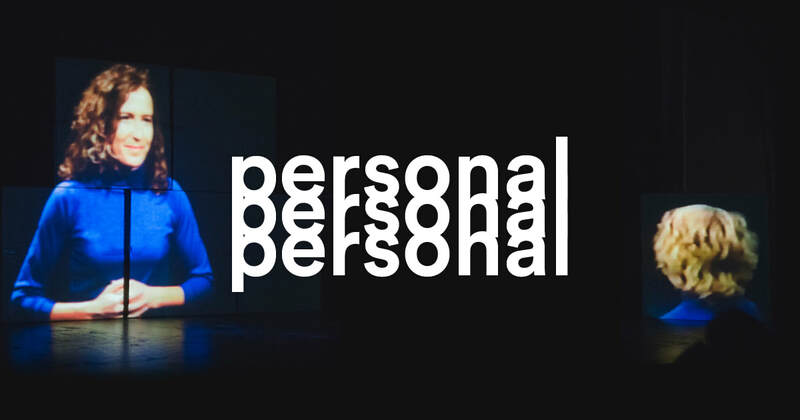 So it was with some trepidation that I attended Jodee Mundy’s stage performance of Personal. This stage performance explores her life as a hearing person in a Deaf family. I expected more of the same. I could not have been more wrong. I was not sure how this story would unfold on stage. I was even more perplexed when I saw the stage. There were about six large boxes set strategically around the room. On the stage you could see coloured tape. Presumably the tape was placed so that actors would know where to stand. But this was a one person performance. The complexity of the stage set up intrigued me. Jodee enters the stage wearing an inconspicuous blue outfit with simple white sneakers. She looks around at the audience to acknowledge all who are present. Most she would have known as members of the Deaf community or the theatre fraternity. She smiles broadly and begins her tale. She uses Auslan to sign a part of the story and then voices for the hearing people in the audience who cannot sign. She reverses the order, voices then signs. In this way she introduces her story and her family. As I watched I thought to myself that we were in for a long night if this was how the whole performance was to be conducted. And then the lights dimmed. In the background Jodee can be seen frantically/gracefully rearranging those mysterious boxes. These boxes, as it was soon to become apparent, were to be the prime means to convey her tale. Onto these boxes were beamed old films of Jodee’s family, Jodee as a young girl, trips to the beach, family dinners and so on. Through rearranging the boxes pictures would change. They would change from small, expand to large or shrink to single shots. It was fantastically choreographed. The boxes were a fascinating sequence of film, light and sound that were all used to convey Jodee’s story. Sometimes Jodee would hold the boxes aloft so as to capture parts of the film. I am told that each box weighed 13 kgs. Jodee herself is just a wee waif. I am amazed at her strength. I am told that to get the films, light and sound all working in proper sequence there were more than 700 moves programmed into the computer. In one sequence Gavin, her brother, is being beamed to one of the boxes. Through clever use of timing and questions Jodee and Gavin discuss her life growing up as the only hearing person in a Deaf family. Jodee would come home from school and her parents would have a list of phone calls that she had to make for them. At first it was just a few. As Jodee became older the list grew and grew. It became clear that as a child Jodee had to take on an enormous amount of responsibility. She would be talking to adults and conveying adult concepts to her parents. Sometimes her parents would be anxious and want to know what the hearing person was saying. They would be demanding and for Jodee this was likely frightening. One can only imagine how traumatic this could have been for a young child. This young child having to deal with adult concepts, adult language and then having to ensure her deaf parents and the hearing person understood each other. She asked her brother through the medium of the box whether he thought this premature responsibility harmed her development and impacted her as an adult. Gavin thought about this for a while and said with a wide grin – “Well it made you a better interpreter.” And we laughed. Jodee didn’t want sympathy. Her subtle humour throughout the performance was a joy. For me the best parts were the stories of how growing up in a deaf family that led to behaviours and gains. In her first share house she was known for being noisy. Growing up in a deaf household she was used to being as noisy as she liked. She told the story of how she, as a 15 year old, sneaked her boyfriend into the house while her parents sat unknowing and unhearing in the front room. It reminded me of my own kids who would often tell the McDonalds checkout person to get a large coke when I was asked what size I wanted. They did this knowing that I had not heard the checkout person. The clever thing for me was the use of the light show to represent how Jodee was torn between the Deaf and hearing worlds. On the boxes were beamed a series of lines and squiggles. Jodee would contort and align her body to fit in with the rapidly changing shapes of the lines. When they curved she curved and when they straightened she straightened. Her face would contort into concern or seeming internal pain as she tried to fit into all the different shapes that the light formed. It was both graceful and haunting at the same time. Bravo Jodee, not only did you make me enjoy theatre but you also profoundly moved me. It is simply compelling theatre and not to be missed! Jodee will be performing Personal around country Victoria and in Sydney at the Sydney Opera House. I believe there are performances in Paramatta too. If you can, I urge you to go and see it – You will not be disappointed! Click on the link below to find out where she will be performing.